At the beginning of the school year, I attended back to school night. I met with my daughter’s English teacher for the first time. I was captivated by his enthusiasm, his love of literature and passion for teaching. I so badly wanted to become a student again. I wanted to absorb all the knowledge found in those books and experience the stories either again or for the first time. And, I really wanted to share it with my daughter. Newsflash, teenagers don’t like to read books with their parents. When my kids were little we read together daily. I read them hundreds of picture books, novels, and magazine articles. We even listened to audio books. Sadly, the only time we discuss a book now is when they need me to explain it to them. When the night was over I kept thinking how great it would be to have a reason to read together with my daughter again. Especially now that she is at an age when she can engage in more profound conversations. My call out to the universe must have been pretty strong; a few weeks later I received a group email from Lilyan’s English teacher asking parents if they would be interested in doing a parent/child book club? I couldn't hit the send button quick enough with my reply...YES! Last Monday was our first book club meeting. We discussed the upcoming weeks and how the book club would go. 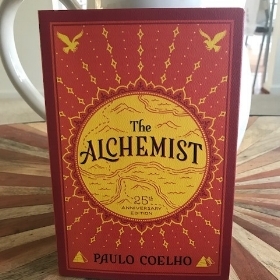 We also learned which book we would be reading, The Alchemist, by Paulo Coelho - another serendipitous moment I suppose.